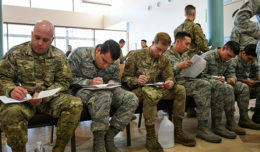 With the repeal of the “don’t ask, don’t tell” policy, many LGBT Airmen felt like they could finally be open about who they are; this included a first sergeant for the Air Reserve Personnel Center on Buckley Air Force Base. Master Sgt. Thomas Metcalf was born in Little Rock, Arkansas in 1982. He said he grew up in a lower-class family that was no stranger to food stamps, spending the first nine years of his life living on a farm with his two siblings. Metcalf’s mother joined the Army when he was eight years old and, Metcalf said, it changed the course of his family’s entire life. It was an equalizer for the Metcalfs and was his first introduction to the military lifestyle. Later on, after a failed attempt at college, Metcalf decided that he would follow in his mother’s footsteps and join the military. Metcalf said he initially wanted to join the Marine Corps, because that’s what he thought the definition of a “man” was; however, he wasn’t yet a legal adult and his mom wouldn’t give her consent. Since Metcalf didn’t know how to swim, the Navy was out. He also figured that if he didn’t want to be in the Army and didn’t think that the Marines Corps would be any easier, the Air Force was the right branch for him. After going through his initial Air Force training, Metcalf found himself at his first duty station on Anderson Air Force Base, Guam. Within his first two or three months of being on station, he heard that he was under investigation for being gay. Not long after his investigation began, 9/11 happened and his command had bigger things to focus on, he said. Metcalf said his first base taught him to be cautious and never admit to being gay. Metcalf was then sent to Ramstein Air Base, Germany, where he was able to be open around his Airmen. He was able to talk openly about his boyfriend at the time because of his support group and the European lifestyle being more accepting of gays. But for people he wasn’t close with, he still had his secrets. He learned to get in the habit of saying “Danielle” when speaking about his boyfriend, Darnell, and changing all his “he’s” to “she’s.” Because of don’t ask, don’t tell, Metcalf still had to remember to keep his stories together. Leading a separate life was now his norm. After his time in Germany, he returned back to the U.S., which also meant he had to return to hiding who he was. It was a smart move at the time, he said. But after six and a half years of active duty service, he transitioned into the Reserve so that he could peruse school and learn how to survive outside the military. It gave him the chance to live a civilian life and be around people who were more accepting of his sexual orientation, he said. On September 20, 2011, don’t ask, don’t tell was repealed and it changed Metcalf’s life. He was now able to be open about who he was. He was now able to be himself and not worry about possibly losing his job over his sexual orientation. 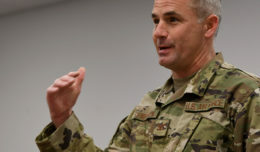 Metcalf’s twelve years, multiple deployments to Afghanistan, Iraq and Qatar, being stationed in multiple countries, and doing his best for the Air Force, were all validated in one presentation, he said. “It still makes me excited to think about,” he said. Regardless of the repeal, nothing was different the next day at work, he said. Metcalf didn’t open up to his coworkers for another two years, but after a while he didn’t feel like it was fair to keep his partner a secret. During last year’s Lesbian Gay Bisexual Transgender Pride month, Metcalf told his story. He said his words filled the crowd with tears, smiles and applause. Part of Metcalf’s inspiration for becoming a first sergeant was to help Airmen through tough times like he experienced, he said. Metcalf hopes to see, in the future of the Air Force and the U.S., an equal workplace for all LGBT and straight Airmen. 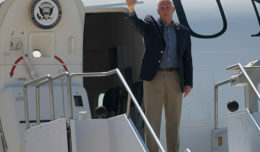 “My hope going forward is that LGBT members serving in the military and have served in the military are able to take part in the freedoms that we have served to protect,” he said. Metcalf wants everyone to know that no matter what someone’s sexual orientation, background or story is, if they have decided to serve, that is all that matters, he said.